The main focus of PROMPT EXCURSIONS is the schedule of daily outings in Palermo and its environs. Over the course of the week, we visit towns, villages, and coastal landscapes, each of which culminates in an afternoon of dedicated writing time. A series of prompts, tailored to each day’s excursion and based on Sicilian themes, will be distributed. The prompts are designed to spark creativity, drawing on the experiences and settings from each outing, so participants have as much creative guidance and support as they need. The first half of every day is spent exploring Palermo and its environs. We will visit villages, a vineyard, take a walk along the seaside, and get to know the distinctive character of Palermo. Participants will learn how to expect the unexpected; how to observe layers as aboveground archaeologists. Several hours every afternoon are set aside for creative production. Participants can use the time for writing, journaling, or making progress on an on-going project. Don't feel like writing one day? You're also free to continue exploring Palermo on your own. Street food, world class cuisine, fine wine, and trips to markets are part of the experience. So are attractive, comfortable rooms in charming hotels. In Palermo's Vucciria, eating is a feast. Arancine--of Saracen origin--are the royalty of street food: heavenly rice balls fried in oil with a filling made from fresh tomato ragù and peas or with butter, saffron, cheese and ham. Panelle are of Middle Eastern origin. These are fried chick pea pancakes that are stacked and served inside a sesame bun. Sfincione, homemade flatbread, is Spanish in origin. Then there is stigghiole : goat or lamb intestines rolled with lard and parley, served with salt and lemon. The Pani ca’ Meusa is a bun filled with sliced spleen, cooked in lard and served plain, with lemon juice or with sheep ricotta. 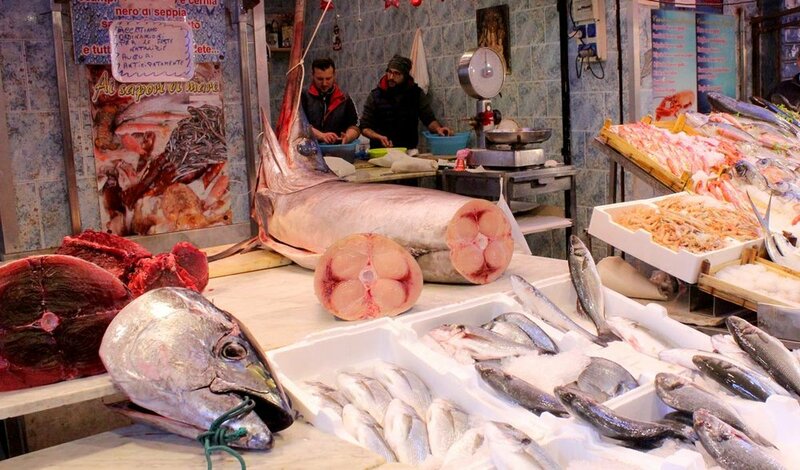 One of Palermo's many markets, in the Ballarò, the freshest fish, bread, produce and flowers can be found. 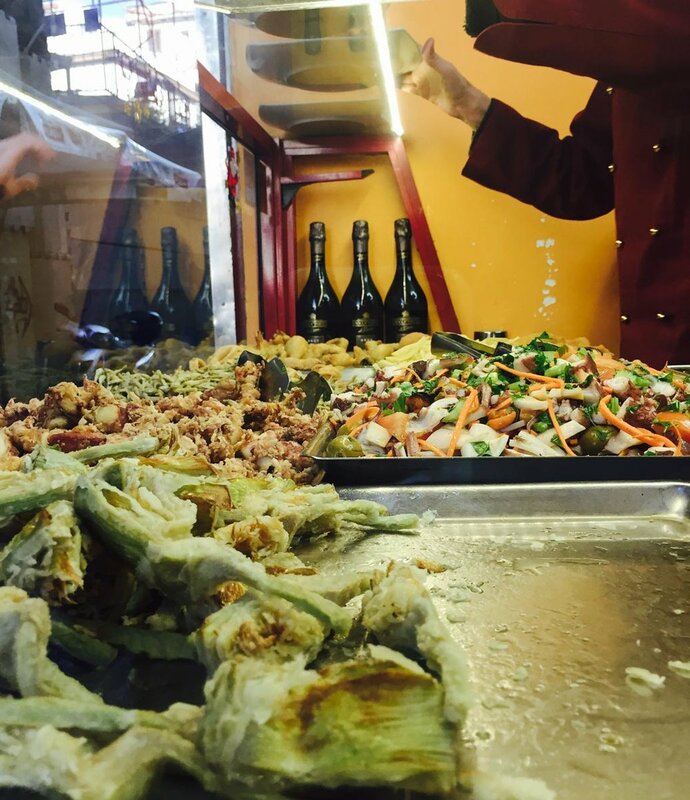 Primarily a food market, the Ballarò is also a street eater's delight. In addition large numbers of discount clothes stands are also here. The shopper can find vintage clothing as well as the latest in Italian fashions at cut rate prices. Fine dining, from a starred Michelin restaurant to other venerable establishments, prepare homemade pastas, grilled swordfish and pomegranate rolls, and tangerine compote laced with star anise and peppercorns. Walking through town, or along the coast provides for surprises in nooks and corners and crannies, by day. Theaters, cinemas, and bars, offer more delight for the adventurous somnambulist.